Data quality is a critical part of any good data operations strategy. 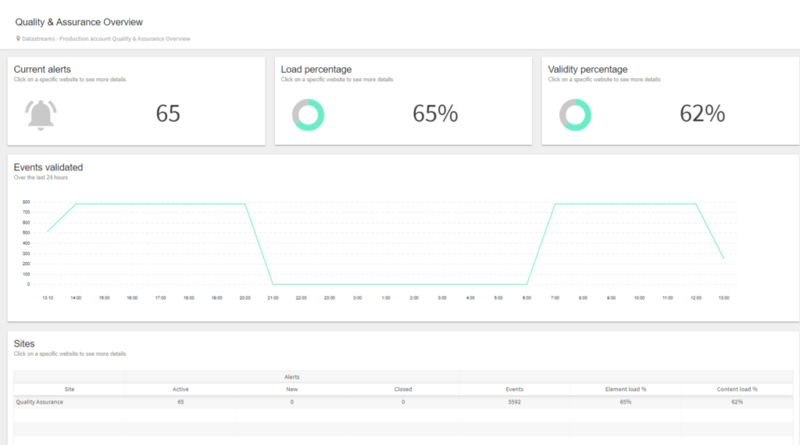 Our Data Quality & Assurance Module enables companies to monitor and validate 100% of the data that is being streamed to its endpoints, like web analytics and digital marketing platforms. Trusting data again, having correct actionable insights, and staying in control during the digital transformation and evolution has never been easier. Get direct alerts on any problem with the loading of marketing tags, an important advantage, since tags are crucial to the success of your campaigns. Our module validates real user behaviour and has no problem with monitoring development, test, or staging environments. Development teams often use our module during sprint cycles to ensure new releases do not corrupt data collection. Discover and solve errors in digital data collection that lead to differences between order numbers in analytics solutions and back-end systems. "By 2020, 90% of traditional, domain-specific event correlation and analysis tools will fail to provide accurate monitoring and root cause analysis, leading to high costs, and low productivity from excessive false positives." To ensure organisations can start trusting their data again, our Quality & Assurance module validates the data that is collected in real-time from all browsers and devices. The module is designed to give an alert on incorrect data and automatically stops this data from being stored when detected, preventing corruption in your datasets. Since the module is automated and checks data quality at the source, it also prevents organisations from wasting time and resources on analysis on low-quality data and manual discovery and analysis of issues. Enabling organisations to exert real-time monitoring and control over their data quality increases the trust they can have in their own data and improves collaboration when sharing data with third-party partners and customers.